Decadent Fruit Omelet was posted on September 27th, 2012 and is filed under Breakfast, Gluten Free, Kid Friendly, Low Carb, Protein, Recipes. This entry has 17 comments. You can follow any responses through the RSS 2.0 Comment Feed. This omelet is my Dad’s absolute favourite meal ever. Whenever we go to a certain restaurant he always orders this fluffy omelet stuffed with juicy fruit and whipped cream. Always. So thanks Dad for inspiring this tempting and delicious egg dish. It’s great because it’s loaded with protein, healthy fats, and is very low in carbs. Whether you want to have it for a filling supper meal or have it for an indulgent Saturday morning brunch, I can guarantee you’ll love it! Serves 1-2. Whisk the eggs and water until they are completely blended. Mist a non-stick pan with olive oil and cook. Once it’s done on the one side, flip carefully and cook the other side. 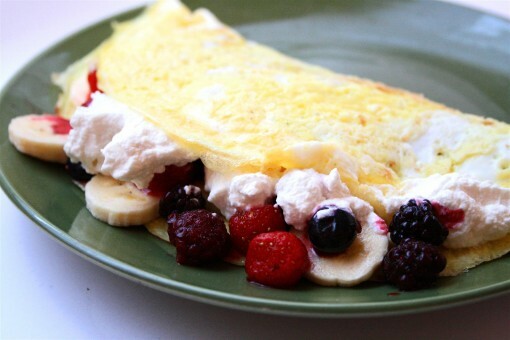 Fill half the omelet with whipped cream and the fruit. Fold over. Top with a little more fruit. Eggs with fruit? I would never have tried that! This looks delicious! That kind of reminds me of a crepe. I’ve always loved frittatas, especially one I would cook with shredded sweet potato on the bottom. These days, I’m always looking for a good vegan version. How beautiful!! I make banana omelets all the time, just finished one actually, but this is so unique! Love it, thanks for sharing! Too bad I don’t eat eggs. That looks beautiful! Oooh, I never thought of having a sweet omelet! Good idea, now this is something I have to try! Oh. My. Yum. This looks delish! I never would have thought to put fruit in eggs! Looks delicious! oooh mine is not nearly this DECADENT. Looks delicious! I always think of savory omelets, but this one looks heavenly! I would have never in a million years thought of this. I really like pineapple in my Hawaiian omelets though! This looks absolutely delicious! I must try it! 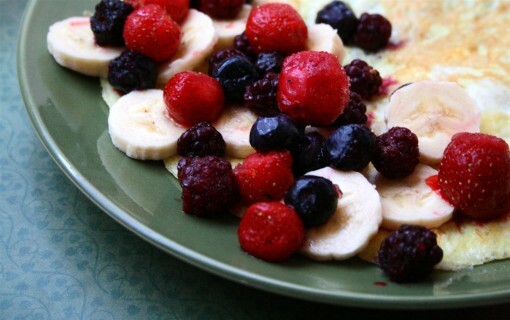 I would never think to do fruit in an omelet but that looks SO good!